We are not "physical machines that have somehow learned to think...[but] thoughts that have learned to create a physical machine". 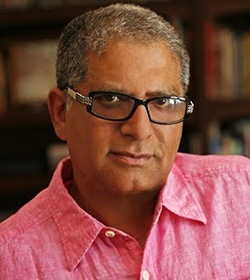 ~~ Chopra, Deepak (2009) . Quantum Healing: Exploring the Frontiers of Mind Body Medicine. Random House. pp. 71–72, 74. Dr. Chopra's father was a cardiologist and his father's father (paternal grandfather) was a military sergeant. A younger brother is also a clinical professor of medicine and hospital physician. Marriage-1 is framed by 7th-from-Chandra = 2. The spouse has a fixed eye on capital wealth and genetic lineage. Such a spouse is often knowledgeable in matters of banking, history, values assessment, music, containment, and collections. The wife is also influenced by Zukra-yuti-Ketu which lends a peculiar yet shrewd detachment toward the native's partnerships, both business and personal. Chandra-8 ruling Shani-6 is protected by both the Harsha Yoga AND the Vimala Yoga Protections extend to the realms of rejuvenation, identity change, evolution (8) and work in hospitals, enclosures, invisible terrain, including the worlds of meditation and dreams (12) Dr. Chopra's message has also helped to rejuvenate(8) the Ayurvedic medical culture in the western-leaning strata of middle-class professional India. For any Kumbha nativity, Brihaspati confers considerable dhana. In Chopra's nativity, not only the normal abundance of financial 2-11 Guru is present, but also Guru ruler of 11 located in 11th-from-11th, forminf a highly productive funding yoga. The parivartamsha evokes not only Zukra-Kuja, but also all of the Thula graha-9. 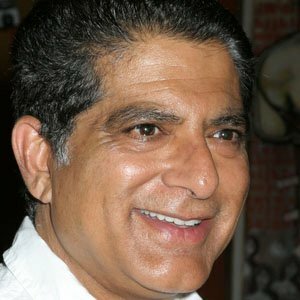 Endocrinologist and Ayurvedic physician Dr. Chopra is recognized as a major international teaching authority, writer, social networker, and businessman. 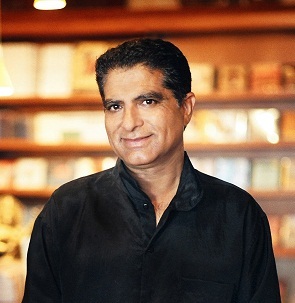 Possessed of a rare dual competence parivartamsha in both allopathic and Ayurvedic medical systems, Chopra developed an integrated interpretation of the historic vidya of Ayurvedic medicine within contemporary healing practice in western allopathic medicine. Yogakaraka Zukra rules the cluster in bhava-9 professorship, principles of theory and philosophy. Chopra has significantly expanded the knowledge base of many allopathic and Ayurvedic practitioners and in doing so has widely influenced the understanding of body-mind healing in the North American and European healthcare systems. "Holding on to anything is like holding on to your breath. The only way to get anything in the physical universe is by letting go of it. Let go and it will be yours forever."